Foundations Live, the region’s biggest co-located construction trade and careers event, will be hosted for the third time this year on 10th October at Bishop Burton College, East Riding of Yorkshire. The event, held in partnership with the Construction Industry Training Board (CITB), will address an increasing demand in skills and employment in the region’s workplaces. It is estimated more than 9,000 jobs in the sector will be available in the next five years, with total growth in the Yorkshire and Humber region forecast at 1.1%. When it was launched in 2016, Foundations Live gained immediate interest from schools, colleges and organisations representing the full cycle of works in the construction industry – from architects to landscape gardeners. 2017’s event stayed at Bishop Burton College but moved to the larger Equine Arena to accommodate the greater demand from companies wishing to exhibit their trades, and interest from schools and colleges – with hundreds of students attending. Wednesday 10th October will see Foundations Live in the Equine Arena once again. With demand expected to be high in 2018, places for students are limited and are allocated on a first come, first served basis. Schools should register as soon as possible following receipt of an invitation in order to avoid disappointment. Foundations is Hobson & Porter’s initiative for helping to create a sustainable workforce in the construction industry. This includes an apprenticeship scheme and work placement programme which have both seen a number of young people learn a variety of skills from grass roots level. 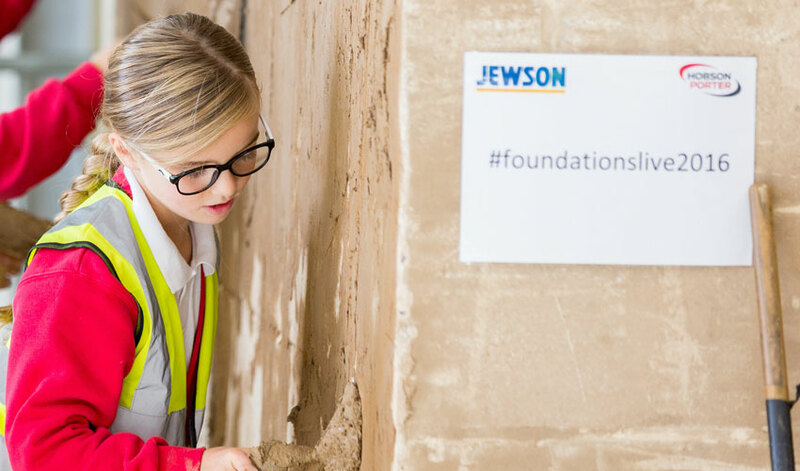 Foundations also includes workshops aimed at inspiring young people to think about careers in construction by showing how they can apply their maths skills in a practical way within the industry. The Construction Industry Training Board (CITB) is also a partner. Foundations Live brings the concept of creating a sustainable workforce into an event space at Bishop Burton College. As a careers event, it gives people of all ages the opportunity to find out about the great variety of career options in the industry, where they can train and how it can be funded. At the same time, organisations from throughout the industry exhibit their products and services, network with other suppliers and tap into the potential among the students. David Blades, Business Development Director for Hobson & Porter, said: “We’re delighted to be bringing Foundations Live back to Bishop Burton for the third year running. The event has grown each year in size and stature and we are looking forward to welcoming more people than ever and exposing them to our exciting industry. CITB has a regular presence at the event to provide information about grants and fundraising to support the industry in developing the workforce – including apprenticeships. They offer the very latest facts and figures about employment in the industry, which highlight the need for employers to be proactive about creating a sustainable workforce.